So it is happening! 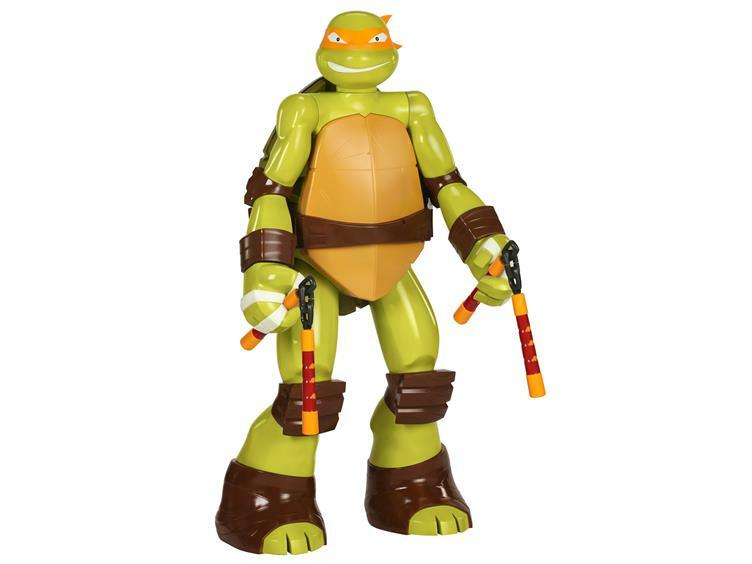 Toyark sponsor Big Bad Toy Store has posted pre-orders for a 48″ tall Nickelodeon Teenage Mutant Ninja Turtles Michelangelo Figure by Jakks Pacific. At 4 feet tall, this is likely to be the largest figure (it looks to have at least 3 points of articulation) in your collection. The price is listed at $89.99 plus shipping. The shipped package is listed at 105 pounds, so shipping costs aren’t going to be too cheap. We first got a look at this figure during Toy Fair 2014. You can pre-order the figure by Clicking Here. It’s scheduled for release some time in the fourth quarter of the year. Check out an image after the jump. If I can find this for free or flat rate shipping, I might just give in and buy it. I understand $90 is cheap for a 4' fig, but c'mon... they could've sculpted it better and given it better paint apps. That thing is hideous. Other than the way the shoulders and collar bone area look, I think this looks pretty much perfect. Only paint it's really missing is the blue for his eyes and some freckles/spots. 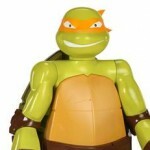 That said, I don't have any interest in owning a life-sized Mikey. I kinda hope they do Leo (my nephew's favorite) and Raph (my favorite) in the future. Ones based on the new movie would be cool to see too. Agreed. Forever baffles me when I get a 2" japanese capsule figure with incredible sculpting and paint and compare it to...most other companies. Seems like a nice display for a store owner though. $90+?! Yeah it's cool and big but 3 POA no thanks. MAYBE at $40 or less. It's not bad. Especially if it has some points of articulation. I think its one of those things where they need to release all of them, and not just one. They're probably doing one to see how it sells and do more later if successful, but I think with this, you either go all in or not. Even with no articulation, this thing is still priced insanely low. How many other companies release 4 foot tall statues for under $100? How about under $1000? There making a million of them instead of 5,000 or less. Do you have a source to back up that claim? I like Mikey and it is under a hundred. If I can find it in retail I'd buy it to save on shipping. But it is from Jakks, I'm kind of weary about the durability/quality.